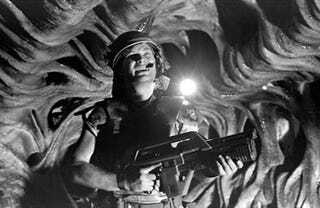 When Aliens came out in 1986, Michael Biehn played the Marine squad leader Corporal Dwayne Hicks. But before that casting, James Remar (who can be seen most recently in Horns and heard in Destiny, and is lodged in many people's minds as Harry Morgan in Dexter) filmed a chunk of the part. I had a terrible drug problem, but I got through it. I had a great career and personal life, and messed it up with a terrible drug habit… I was initially cast as Corporal Hicks, and I was fired after a couple weeks of filming because I got busted for possession of drugs, and Michael Biehn replaced me.